The spirit of Liszt and Busoni lives on in the passionate intellectual writing of the Blackburn-born and Scottish-resident composer Ronald Stevenson. We hear far too little of his music in concert or on record these days. 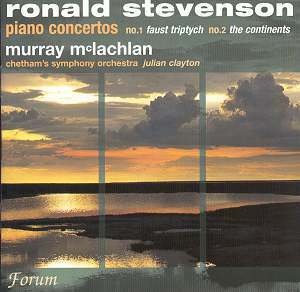 While we continue with frustration to await first recordings of his 1992 Violin Concerto and 1998 Cello Concerto, Stevenson's two piano concertos were first recorded in 1992 and issued on the late lamented Olympia label in 1993 (OCD 429). These are provocative, stirring and yet totally unbombastic concertos with a serious jaw-set and with unfashionable grandeur in their grasp. The First Piano Concerto is called Faust Triptych and was premiered in Glasgow by the composer in 1966. The Faust in question is Busoni's Doktor Faust. The work's seriousness of purpose does not preclude grand romantic gestures even if these are sometimes lichen-hung as in the early part of the Fuga finale. Rachmaninov's Piano Concertos 3 and 4 (III, 3:48), Medtner's Ballade Piano Concerto No. 3 (III) and Liszt's Totentanz (I) occurred to me at various points. However this is truly the work of an original unafraid to show his roots. Be not afraid of the student orchestra for the results are thoroughly professional and of course Murray McLachlan has a justified leonine reputation in this sphere. The notes are also by Murray McLachlan.